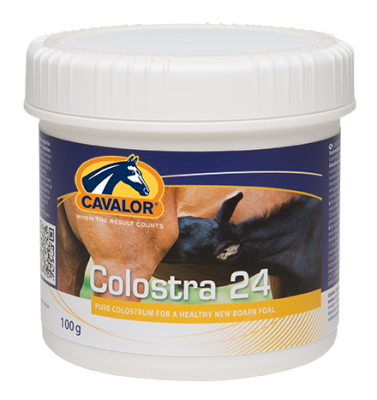 Cavalor colostra 24 is given to newborn foals as a replacement of colostral milk should the foal not receive any from the mare, or the quality of the mares’ Colostrum be sub-standard. Cavalor colostra 24 can increase the content of immunoglobulins in the blood.This makes the foal better able to combat pathogens during the first week of life, until it develops its own immune system. The danger of an immunity gap will be smaller, which helps protect the foal against infection and disease. Cavalor Colostra 24 is IBR-negative and safe for use with all foals and contains at least 30% of immunoglobulins. Dosage: To supplement the mare's shortage of colostral milk: administer 100 grams of colostrum powder to the foal within 24 hours after birth. To replace a total lack of colostrum: administer 100 grams of Colostra 24 within 6 hoursafter birth and repeat this administration after 12-16 hours. The Colostra 24 powder can be added to 200ml of premixed milk replacer and fed. Always serve at a temperature of 36-37°C.